As a parent or teacher, you may be looking for an accessible way to improve your students’ academics. Learning apps may be the answer. 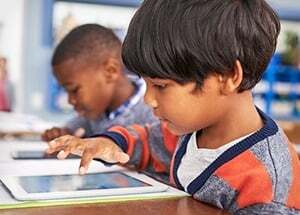 With iPads and tablets becoming more and more commonplace in schools, learning apps provide an easy way for your students to practice or improve their skills in a variety of subjects. We’ve explored several learning apps for grades K-12 that you should check out. If you are looking for a comprehensive learning app for younger students, this is a great choice. The ABCMouse app covers reading, math, art, music and more. It was created by teachers and education experts and features books, videos, games and other learning activities for students. The app is available on iOS and Android devices but requires a subscription to ABCMouse.com for $9.99 per month. The subscription includes accounts for one parent and three children. However, ABCMouse offers a free membership for teachers. If your student is struggling with those basic math skills, this app is a great option. Math Cards allows students to practice multiplication, addition, subtraction and division in timed or non-timed problem sets. This app is free on iOS and similar apps can be found for Android. This app is sure to please, with over 100 learning games featuring your students’ favorite PBS TV show characters, including a certain red puppet and large, yellow-feathered friend (hint, hint!). This app largely focuses on fun games and puzzles that cover science, math, reading, creativity and more! It is available for both Android and iOS devices for free. If you’re looking for an app for your older students that struggle with math, this may be the one. PhotoMath covers basic arithmetic, fractions, decimals, linear equations, trigonometry and more, up through calculus. You can take a photo of a written math problem through the app and it will recognize and instruct you on how to solve it. Free for both Android and iOS devices, PhotoMath can help students better understand challenging math concepts or just check their homework. This app is a great companion to help students learn a variety of foreign languages, including Spanish, French, German, Italian, Chinese and many more! Duolingo allows students to practice speaking and listening to languages in a game-like interface. It is free for both iOS and Android devices. This app may improve student achievement across all subjects. As a brain-training app, it tests critical thinking, memory and problem-solving skills through games. Lumosity was developed by scientists and designers to explore cognitive research. They also work with over 40 university researchers around the world. Fun for any age and free for iOS and Android devices, students can understand their mental strengths and weaknesses and improve their cognition. Don’t let your students mindlessly scroll through their favorite social media app! Introduce your students to learning apps, and it may be the perfect way to improve their education. Teachers and Educational Staff! Does your school provide iPads or other electronic devices to your students? Make sure they are protected from accidental damage, theft and more with a Worth Ave. Group policy. Get a FREE Quote for K-12 School Device Insurance! Parents! We protect any laptop or tablet for your child against cracked screens, liquid damage and more! Get a FREE Quote for an Individual Device Policy!